As a child in the 1980s, I grew up with all things Star Wars: the movies, the John Williams score, the toys, the posters, the Muppet Babies special reenacting the story from A New Hope. You just knew that this theme would lend itself to a a great race event. I knew I would be running, so the only question would be which events I would be running. I spoke with Jennifer, Candace, and Jake, and we all decided to run both the half marathon and 10k events as a part of the inaugural Dark Side Challenge (runDisney does love challenges!). We passed on the 5k event because, well, frankly, I don’t think that the high cost is worthwhile. Not only is it an expensive 5k, but runDisney gives out cotton t-shirts instead of tech race shirts and they give out rubber medallions instead of medals (yes, it is all about the bling). Training-wise I knew I would be fine for this event. An April event date made it a great motivator to keep myself honest with my training throughout the long, cold Ohio winter. As it would happen, this would end up being my third and fourth races in 3 weeks, as I had run the Cherry Blossom Ten Mile Run and the Lake Health Running Series 10 Mile Drop Course race during the two weekends leading up to this race, so I knew, from a physical standpoint, I would be ready. Originally we were scheduled to fly in on Thursday (the 10k took place on Saturday), but Candace pushed for an arrival on Wednesday so we could be at the opening of the race expo on Thursday morning. While I did not have a burning desire to go to the expo for opening, I would never say no to more time in Walt Disney World with our friends! 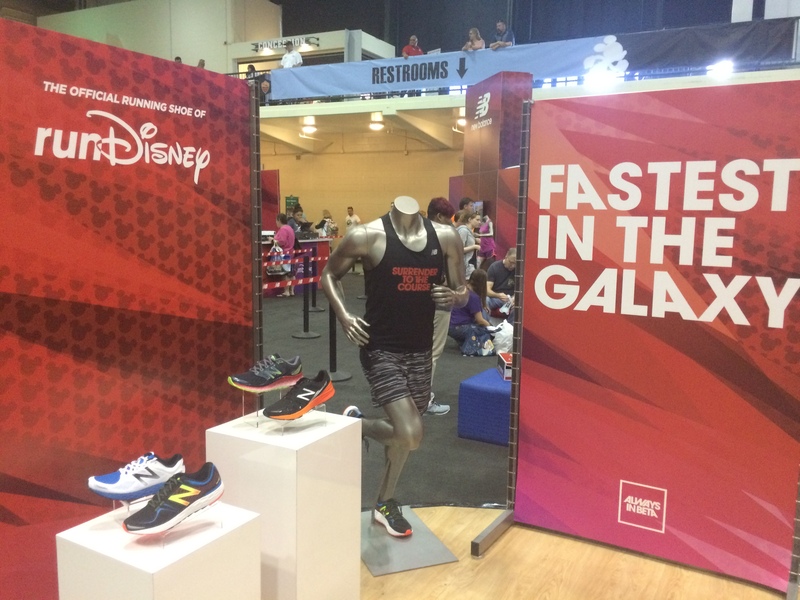 We knew going into it that this would not be your typical runDisney race expo. 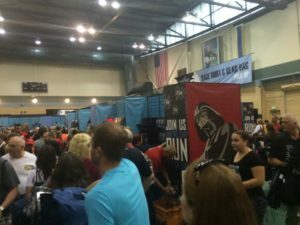 Jennifer’s experienced during the Rebel Challenge weekend and the crazy crowds of Star Wars merchandise seekers led us to conclude that this race weekend would be no different. And we were correct. We woke up early on Thursday morning (the first day of the expo) as we knew we would be taking an Uber to the expo instead of using event transportation to get to the expo, which turned out to be a good thing. Event transportation was scheduled to leave WDW resorts starting 1 hour before the expo’s scheduled opening time, but we arrived at Wide World of Sports, were parked, and standing in a very long line for event merch a little over 2 hours before the scheduled opening time. And the line was looooooong! I ventured up to speak with the first folks in line. The first runner (and yes, he was indeed a runner), told me that he arrived at 4 am and noone else was there, he just figured out on his own where the line would be forming. The second guests arrived at 5 and 5:15 respectively. We were several hundred people behind them in line, so that gives you a little idea of what to expect for future expos. To our surprise, the doors to the merch area opened about an hour earlier than scheduled, which was about the same time that event transportation was scheduled to start running. Now, while we appreciated runDisney’s efforts to help get the growing crowds through the doors, there was one obvious problem. If you flew to Walt Disney World, paid a premium to stay at an on-property resort, and relied on event transportation (as runDisney encourages runners to do), then you were at a disadvantage and could not possibly make it to the expo in time for its early opening. Additionally, even if you took the very first shuttle from your resort, you arrived to see long lines already formed. This is just something to consider if being at the expo for opening is your thing. The special merch for this event did not disappoint. Having the Star Wars universe to pull from gave designers the opportunity to roll out some great shirts and other gear. If you were there for opening (um, the early opening that is), you saw a bit of a mad house. Sadly, not unlike rope drop at the parks, many people refused to proceed in an orderly manner, trying to skip ahead of the processing line. Once inside the merch area, it was like Walmart on Black Friday. Which is to say, it was bad. I saw people grabbing armfuls of jackets and shirts. Pins by the fistful. People were trying on shirts and jackets amidst the chaos, which only added to it, but I can’t fault them, when you are paying upwards of $80, you want to make sure an item fits. Additionally, at one point I saw a woman on an ECV trying to back up in a crowd, so I and another guest helped her out by asking some people to move, not only did she not acknowledge our assistance, but she rudely pulled forward and literally ran into someone standing in line and then pulled away without so much as an apology. It was not a pretty scene. We saw cast members working hard to restock items as quickly as they could, but there were just too many people in the relatively small space, making their job difficult. In the end, it appeared as though there was plenty of merch, they just needed the time and opportunity to restock. So, other than the initial Oklahoma land rush stampede to the official race merch at the early opening, the lines were, for the most part, orderly, albeit long. 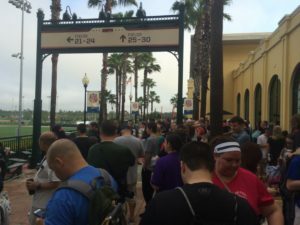 Any veterans of a runDisney expo at Walt Disney World knows that they split up the activities over several buildings in the ESPN Wide World of Sports complex – bib pickup is in one building, event merch and all of the vendors and speakers are in another. We started off in the latter, so we had to go next door to get our bibs after we were done shopping. Perhaps it was a combination of the early opening time and that everyone was focused on getting event merch first, but I have never gone through a bib pickup line at a runDisney event so quickly. The volunteers moved us in and our efficiently. The photos for challenge participants (to confirm your identity at the race finish) were immediately next to your bib pickup. So they had us in and out very quickly. The shirt and gear bag pickup was in the same area as the bib pickup this year, which was nice and helped us get in and out quickly. Once you left this building, if you wanted to go to the second building where the merch and other vendors were, you were in for a long walk and a long line. We had to go down stairs and around a large sports field, where people were lining up to walk up a set of stairs into the second building. We did not anticipate this and, even though we did not want event merch (we already had bought ours) we had to wait in this line. The reason we were going back in was to visit the other vendors and buy some KT Tape and fuel. Had we had another option for either of these, we would have skipped returning to the expo to avoid the huge line, which is not a good sign for vendors who pay a lot of money for the floor space. 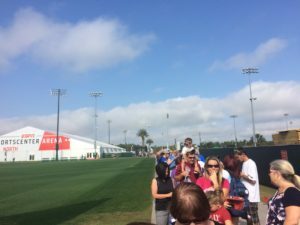 This line wrapped around the sports fields just to get into the second building of the expo. This is where runDisney hit a home run, 2 home runs actually. I frankly don’t expect a lot out of expos as they aren’t really my thing. 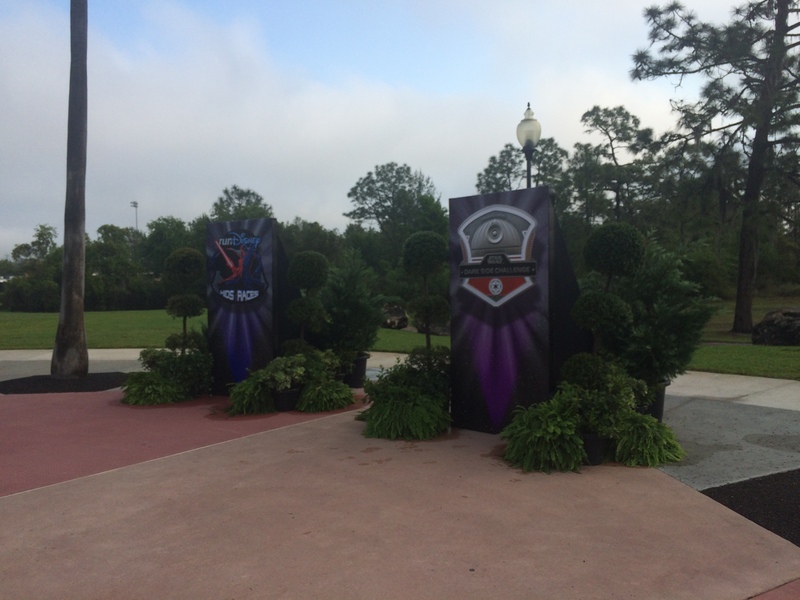 runDisney usually gives runners some nice photo ops with themed set pieces at event expos. And I do enjoy these. However, this time they one-upped themselves. 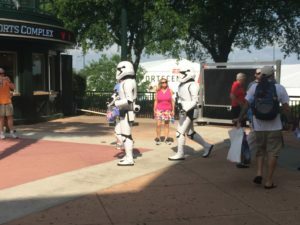 While waiting in line, and throughout the expo itself, guests were treated to “walk bys” from squad of Storm Troopers who were, in a word, hilarious. This was a great touch and was well-received by the guests. They also had a special photo op with BB8! Let me say that again: They also had a special photo op with BB8! Now, all I have heard about since Candace and I first saw The Force Awakens is how awesome BB8 is, she loves BB8. So when I learned that they had a meet and greet, I knew we would be going. 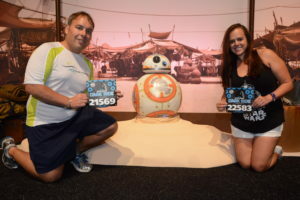 They had BB8 set up in a special tent with a nice themed backdrop and a PhotoPass photographer. This was a great bonus to the expo and one I would like runDisney to incorporate more of at future expos. What made this even better was that access was restricted to those with race bibs. Which meant the large number of fans who were making the merch lines so long were not able to make the BB8 line longer because they could not access the building. It made for a nice little perk of running the race. And yes, you could bring your family and friends in with you so long as you had your bib. Thank you runDisney! Why am I so excited? Because we got 3 SHORT sleeve race shirts! I know, #firstworldproblems, but I am tired of getting long sleeve runDisney shirts at every race. I like wearing short sleeves in the Disney parks but runDisney keeps giving out long sleeve shirts. It was nice to have a change and I will definitely get some great use out of these shirts because they are great race shirts. Again, pulling from the Star Wars universe, these shirts all display very nice Star Wars artwork, which will be great to wear both in Disney parks and out and about at home. 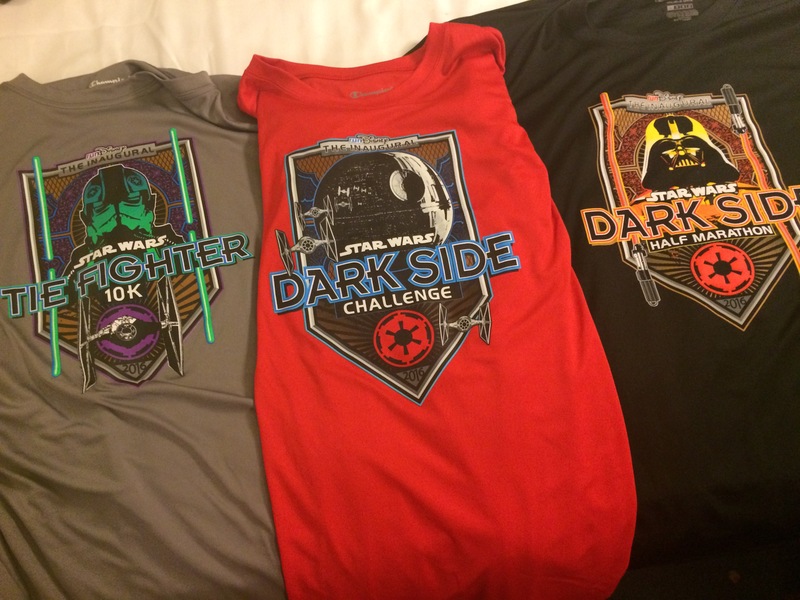 They are of the usual high quality one expects from a runDisney race, so the shirts deserve high marks all around. Other than a small Cliff bar, runDisney does not give out swag, you really have to expect run these races for the overall event theme and entertainment, but that is not to say that we wouldn’t love to see more swag in the swag bags! 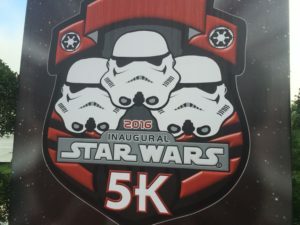 We will cover each of the events in their own articles (this one is already going WAY long), but I wanted to say a quick word about the 5k and Dark Side Challenge medals. As with all runDisney 5ks, finishers receive a rubber medallion instead of a medal. This is extra disappointing as the artwork was very nice and would have made for a very cool SMO. Please runDisney, start giving our real medals for the 5ks! 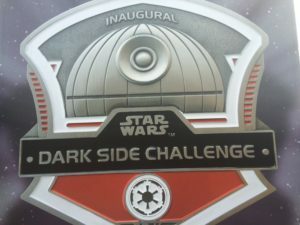 Finishers of the Dark Challenge received a special challenge medal, which was both very nice and up to the usual runDisney standards of quality and artisanship. This SMO features the Death Star from the original trilogy as well as Imperial logos. The SMO has a nice custom lanyard and both the medal and lanyard recognize this as an inaugural event. People specifically seek out inaugural events, and race organizers should recognize this and make sure that the SMOs commemorate this – a fact that runDisney certainly recognizes. Additionally, if you completed both the Light Side Half Marathon in Disneyland and the Dark Side Half Marathon, you received the inaugural Kessel Run Challenge medal, which was in the shape of the freakin Milennium Falcon! Mind blown. This is a strong candidate for the coolest race medal ever. I may have to look into running it in the future. OK, that is going to do it for this installment. However, do not fret, as we said, we have a lot more coverage coming your way, so be sure to stay tuned!